West Bay Mall Condo #7 perfectly located in West Bay for a diver's dream! Just 200 meters from West Bay Beach, West Bay Mall Condo #7 is perfect for those seeking to spend their days outdoors on the beach, diving, snorkelling or exploring. In just a couple of minutes walk you find yourself in the center of West Bay Beach. This spacious condo features a King bedroom with plenty of closet space for dive gear and living room with comfy sofas and a dining table for four. An additional adult or two children can be accommodated on a queen air bed for an extra charge. The kitchen is fully equipped with all you need to relax and cook a great meal after a long day adventuring or simply relaxing on one of the Caribbean's top 10 beaches. There is a large bathroom with shower and a separate area for the washing machine and tumble dryer. The West Bay mall retail units below include a deli, great coffee shop/wine bar, gift shops, DVD & Scooter rentals & pharmacy. The mall has an ATM & back up generator. 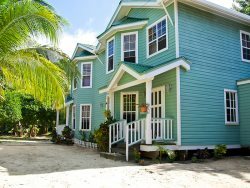 our stay was great the condo is very well maintained and stocked the kitchen is well equipped and the location is great close to all west bay has quiet safe clean and friendly thanks again Brad Ruth and staff ........ REPLY: Thank you very much, please come back and see us soon! Prices based on 2 persons. Housekeeping including once a week (rentals of 7 nights or more).